Sage advice from Mrs. Child, and something I occasionally forget to do. Now, due to Littledude’s vehement refusal of greens I have resorted to trickery and deceit these days. Although a lot of dairy is not good for anyone, cheese is the proverbial “Golden Ticket” of ingredients to get him to eat anything green these days so cheesey goodness hiding the veggies is the way I have been going. Lasagna is a dish that is not very easy to accomplish Gluten Free. Yes there are some gluten free lasagna noodles out there now, and I can’t bash them as I haven’t tried them yet, but a while back I decided to challenge myself and come up with a pasta free option. I am not sure if I am the first person on the planet to make this dish up – probably not – but I have never seen a recipe for it. I mean I haven’t actually looked for one, but you get the idea. This idea sprang up in my head one day and I have made it with great success several times now. Now you may be wondering about the quote regarding the bigger pot, particularly as I have just told you I have mastered this little gem. Well the answer is this. I decided to get even more creative and add a layer of Portobello Mushrooms in the dish this time. What I didn’t take into account is how much larger this would make the dish. I make mistakes. So as I was building the lasagna it dawned on me I had too many ingredients and too small a baking dish. Ok. No real biggie. I just pulled out another baking dish and made 2 gluten free vegetarian lasagnas. Of course I made these both on a night when it was just Nonna, Littledude, Ladybug and myself, so thats a lot of food. So how about freezing one? Nonna said no. She told me that the mushroom one wouldn’t hold up to freezing as well, and the one with the Polenta was the one we all wanted to eat that night so in the end I just cooked both. We had a lot of leftovers that week. Shredded mix of Italian Cheeses. This one is optional, but I find it adds more to the dish. Cheeses like sharp provolone, Fontina, Romano etc add to the flavor. 2 Cans of WHOLE PEELED tomatoes. I use San Maranzino. Let’s talk gravy first. This is my basic gravy for pasta and lasagna’s etc. You may have your own way, but this is how I was taught in my family. It’s not fancy. It’s simple and full of flavor. Get your pot. I used my Le Creuset Signature 3 1/2 quart round wide dutch oven, and for this amount of gravy it’s the perfect size. Mince about half of a medium sized sweet onion and a few cloves of garlic. Simmer them in the pot in some EVVO on a medium to low heat. You want them to release the flavor into the oil, not make them crispy. Next take the 2 cans of whole peeled tomatoes and put in a blender with a few fresh leaves of basil. Our blender broke so I use our Nutri-Bullet and do one can at a time. My grandmother and mother taught me to ALWAYS use whole peeled tomatoes and puree or chop them up yourself, depending on the consistency you are going for. Pre-crushed tomatoes are supposedly the lesser quality tomatoes then the nice juicy whole ones. It’s an extra step, but I think is one of the reasons the gravy tastes so good. Interesting note – the Nutri-Bullet is the BEST for turning whole tomatoes into puree in a matter of seconds! Put the tomatoes into the pot. Next is the carrot. Remember the Tuesday Tip about the carrot? Well I practice what I preach! Wash and peel a large carrot, cut it in 2 or 3 large pieces and put in the pot. Add the spices and S & P to taste. I am sorry I don’t have exact measurements, I just add a few pinches of each until I get the flavor I am going for. Then let it simmer over low heat “don’t let the sauce stick”. I would say simmer for at least an hour, that gives it time for all the flavors to marry and the carrot to cut the acidity and add sweetness to the sauce. When you feel it is ready – use that spoon and taste it – remove from the heat and let it cool. It’s easier to work with when it is not hot. Now for lasagna assembly. As I previously stated I realized rather quickly I picked the wrong size dish. I love using Nonna’s vintage white and blue Corningware baking dish with the glass lid. I am constantly stealing it from her apartment. We recently traded when I gave her back her classic Le Creuset Heritage Cast Iron Oval Au Gratin Baker from the 70’s in exchange for the Corningware dish from the same era. Yeah I know, both are really hers so it’s not very fair – but she knows where to come get it back from. 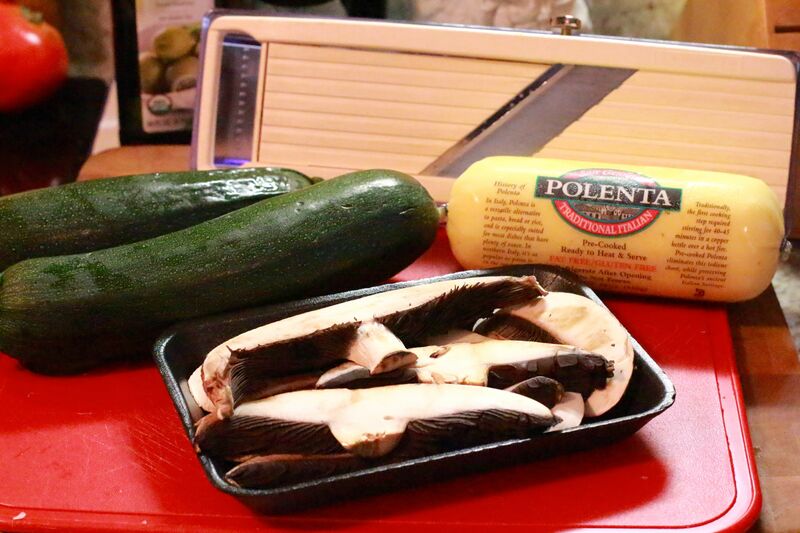 Use the mandolin to slice the zucchini and polenta longways. In a bigger dish you should probably use 2 logs of polenta, but I only had the one in the house, and it worked fine. After slicing the zucchini it is important to let it sit and drain some of the water out and then blotting with a paper towel. Zucchinis are full of moisture and if you skip this step you end up with a watery dish. ALWAYS let it drain or you will have watery lasagna! When everything is prepped and the gravy is cooled you can start layering. There is no exact science to this but I tend to do it this way. Occasionally I add a few slices of fresh Mozzarella on top, but I needed to save it for lasagna number two with the portobello mushrooms. Ok so now the mushroom lasagna. At this point I used up all of the polenta, but as previously noted, there wouldn’t be room for all of the ingredients unless I started with a larger baking dish. I really don’t think that the thick Portobello mushroom slices need the polenta in this dish anyway. HOWEVER ….a note on my mistake on this one. In my haste – as we were nearing dinner hour and they take a good 45 – 60 minutes to bake, I skipped sautéing the mushrooms up a bit. Mistake. I didn’t cook it long enough and the mushrooms were not entirely cooked through. That was a bummer. Although on the re-heat 2 nights later they were perfect. Put in pre-heated 375° oven covered for about 40 minutes. Remove covering and cook for another 10 – 20 minutes or until the cheese on top is bubbling and starting to brown. So the consensus on the mushroom one I already told you. A quick sauté of the mushrooms first would have made all of the difference. The taste was great, but only the adults tried that one, and I still feel I have some tweaks to do in order to hit the mark. The zucchini and polenta one however is a family favorite. Even Littledude ate not one but TWO helpings! It was a grand victory for Zia! These are the nights all the work is worth it! Wow , I’m going to try that!